I use GMail as my primary email account. I receive lots of email everyday from comments on blog post to university assignments and lecture notification . Now whenever i am using windows I usually keep myself signed into GTalk, as GTalk has this nice feature of showing a small notification window whenever new email comes into your inbox. However even though Google has been porting a number of their programs from Windows to Linux platform till now they have not ported GTalk on the Linux platform . 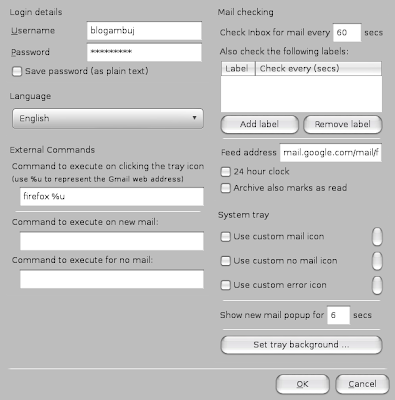 Now since i spend significant amount of my time on the Linux platform i had to keep my GMail account always open in the browser and keep refreshing it periodically to check for any new mail this was frustrating as well as tiresome till i discovered this nifty little application CheckGmail. CheckGmail basically stays in your taskbar and whenever any new email comes it shows a small window informing you about it and clicking on the window actually opens the browser and takes you to the email. After installation is over you can launch CheckGmail from (Applications -> Internet -> CheckGmail ) . The first time you start CheckGmail it will show a dialog box similar to the one shown below asking you for a number of different information about account things like how often it should check for new messages , whether you want to run some application whenever new email comes , command to execute when you click on email etc . 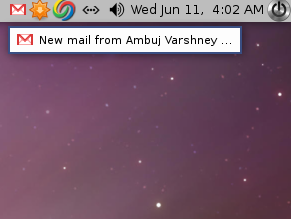 Now once you complete configuring CheckGmail it will reside in the taskbar at the top of the screen. If you hover your mouse pointer over the CheckGmail icon it will show all the unread messages as a list on your desktop. and finally and most importantly whenever new email comes into your inbox it will show a notification like one shown below. Overall CheckGmail is a nifty little application that helps you remain in sync with your GMail inbox and could actually help you concenterate on your task rather than worrying abt checking your inbox periodically in browser for new emails. In my quest for a simple and easy 'Gmail-nanny' I ended up using a customized Conky instance which retrieves information from the atom-feed through a script (which I wrote in Python, after finding a Perl script on the net which used those atom feeds - darn, they come in handy!). 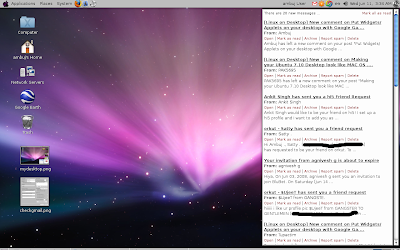 It is not the same as a notifier like checkgmail, but it has some other neat (and customizable) options. Here is what it looks like (top right corner, beneath the clock/date). Some inspiration for fellow Conky users ;-). Pidgin has the ability to check for new gmail messages, and it does a pretty good job at it.